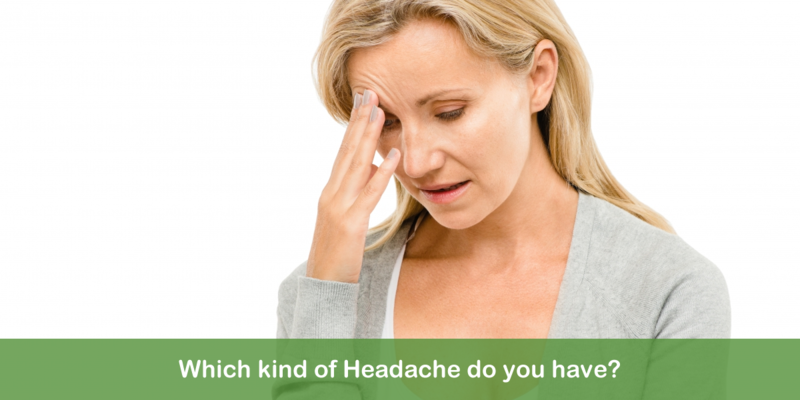 Which kind of Headache do you have? There are several types of headaches you may be experiencing and each headache may not be the same. Cluster headaches are named for their cyclical pattern where symptoms are often clustered together. Cluster periods may last from a few days to a few months but are followed by periods of remission. Often, a cluster headache will present waking someone up at night with intense pain on one side of the head or around one eye. A drooping eyelid, tearing or redness can occur on the affected side. Often lying down can increase the pain. These types of headaches often occur seasonally and with a particular pattern. Your MD should be aware as there may be contributing factors such as medication interaction. It may be beneficial to keep a diary of headaches to chart frequency, onset, intensity, duration or any preceding symptoms to assist in management. Often cluster headaches are worsened with smoking or alcohol consumption, for example. Massage therapy and Myofascial release can be extremely beneficial in conjunction with physician care in treating cluster headaches. Tension headaches are usually more diffuse in nature and are the most common type of headache experienced. This often feels like a tight band around your head or like someone is pushing on the front of your head. A general dull, aching pain and tension around the neck and shoulders are frequently experienced. Exercise may often decrease the intensity and/or duration of tension headaches. Massage and Myofascial therapies are considered some of the most effective treatments for tension headaches along with monitoring stress. This type of headache is actually caused by your neck! The neck, or cervical region, is triggering a headache that often moves up the base of your skull into the temple or behind your eye. Very often the trigger for this type of headache is tight suboccipital muscles, four small muscles that run from the base of your skull into the first few vertebrae of your neck. When these muscles become shortened they pull at the base of your skull and/or form trigger points and the headache begins. Dysfunction through other muscles such as the upper trapezius, levator scapulae or scalenes may be contributing. Treatment focuses on addressing the cervical musculature, vertebral joint mobility and fascial/dural tissues with manual therapy. We will also provide stretches and postural exercises for home to compliment manual treatments. The defining characteristics of migraines are the preceding or accompanying symptoms of nausea, auras, light and/or sound sensitivity, vomiting and dizziness. There are four stages of migraines, although you may not experience each one. Prodrome is the 1-2 day time period before a migraine begins which may include constipation, food cravings, excess energy, irritability. Aura is the time period at the beginning of a migraine that focuses on visual disturbances such as flashes of light or seeing spots. Attack involves pain throughout the head, nausea, vomiting, sensitivity to light or sound. Postdrome immediately follows the migraine where many people feel drained and tired. Medications, food, stress, alcohol and hormonal changes may be contributing to migraines, so it is a good idea to consult with your physician to assist in management. Massage therapy, Myofascial release and treatments such as acupuncture are beneficial to significantly improve intensity and duration of migraines. A headache following a head trauma or whiplash injury that is increasing in intensity. A headache accompanied by fever, confusion, stiff neck, seizures, numbness or difficulty speaking. Sudden onset of a severe headache that is unlike anything you have experienced before.